I had the good fortune to be an invited guest at The Culinary Institute of America’s yearly conference, World of Healthy Flavors in January. World of Healthy Flavors is a collaboration between the CIA and Harvard School of Public Health. It brings chefs, food service operators, growers, and suppliers together to marry nutrition science with delicious food. From quick service restaurants to campus dining, innovations in food preparation and flavor is the outcome of this conference, now in it’s 10th year. After the conference, there is a day added to celebrate “Produce First.” This is where the real fun begins. Teams are established that include chefs, nutritionists, and produce representatives to come up with several dishes showcasing one produce ingredient. I was on the “Tomato” team, sponsored by NatureSweet tomatoes. (Disclosure, I have no financial relationship to the company to promote the product.) We had three types of tomatoes from NatureSweet….”Glorys” (cherry tomatoes, )”Cherubs” (grape tomatoes), and “SunBursts” (yellow tomatoes). All of these fully vine-ripened tomatoes are produced in greenhouses under controlled environmental conditions; everything from the seeds to soil to water is controlled. The result is a delicious, juicy tomato that tastes good all year long. When I first discovered NatureSweet tomatoes at my local discount shopping club, I was excited because, (1) they taste great and I love them as a snack with only 27 calories per cup, (2) they are great roasted and used to top fish, chicken, or pasta. To roast, heat the oven to 450 degrees F. and drizzle olive oil on a baking sheet. Add a carton or two of tomatoes, swirl them around the pan to coat in olive oil and sprinkle with salt and pepper. Roast in oven for 15 minutes and then turn them. Continue roasting for another 10 to 15 minutes until they begin to split open. I use them on pasta for a much tastier and nutrient-rich topping than jarred marinara sauce, or over grilled fish or chicken breast for a quick dinner. Tomatoes, raw or cooked, are a tasty, healthy food. Tomatoes are anti-inflammatory foods and are loaded with anti-oxidants of the carotenoid family. 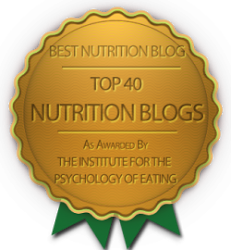 One carotenoid that has gotten a lot of media attend for it’s role in prostate health is lycopene. This compound in tomatoes is associated with lower risk of prostate cancer and stroke. Cooking the tomatoes breaks down the cells, releasing the lycopene making it more readily absorbed. Lycopene is also fat-soluble so eating tomatoes with some fat will also help it be better absorbed. Eighty percent of lycopene in the U.S. diet comes from tomatoes, so start roasting tomatoes in a bit of olive oil to get even more health benefits. 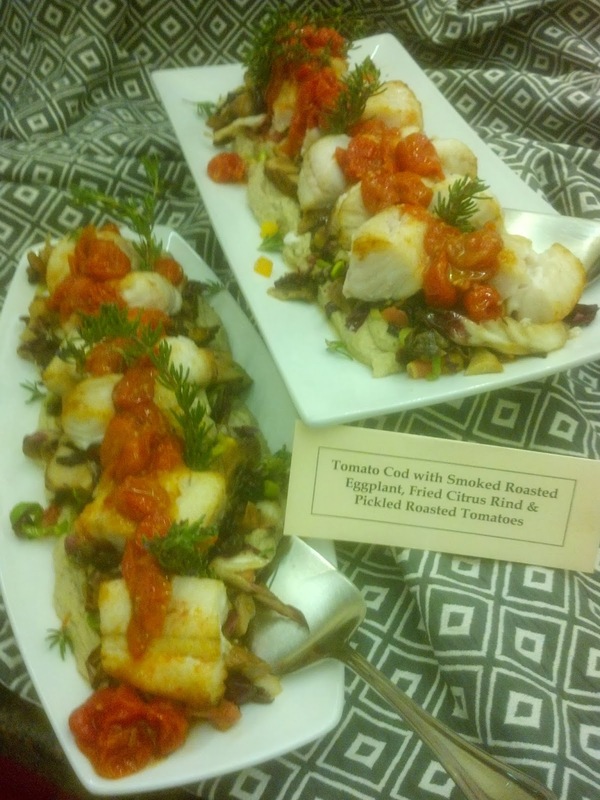 Back to my “team.” The creative chefs came up with many dishes but the highlight was our “Tomato Cod with Smoked Roasted eggplant, Fried Citrus Rind, and Pickled Roasted Tomatoes.” A dish that begins and ends with tomatoes…what could be better?